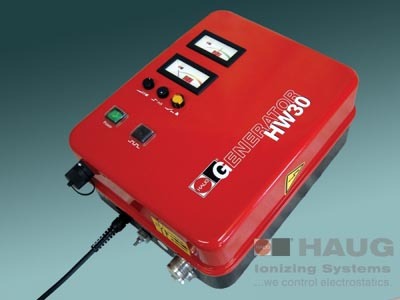 The HW 30 charging generator is a high-voltage unit that is used together with the resistance-coupled HAUG charging electrode ALW and a suitable counter-electrode. The charging electrode must be mounted at 10 to 30 mm above the material to be charged, exactly opposite the counter-electrode. When an earthed counter-electrode is used, it must be in contact with the material to be charged. In order to obtain a constant a reliable charging, we strongly recommend that the materials, whoche are to be pinned together, be neutralized by means of an appropriate HAUG ionizing system before the charging process. The HW 30 charging generator generates an adjustable high voltage up tp 40 kVDC. The device is available with either positive or negative polarity. Integrated measuring instrument show the voltage and the current. High voltage and current threshold can be set with two different potentiometers. In the event that the flowing current exceeds the preset limit, an error signal is received and the high voltage is switched off. The HW 30 charging generator can be set up for intermittent service by means of an external control. An external signalling unit can be activated through the integrated signal connection.